As I stood in the shower this morning, I thought about the fact that I just pressed a button and a torrent of hot water jetted instantly out of the shower rose. “Power showers”, as they are known here in the UK, were such a novelty for us when we first got to London. I then thought about everything else in our day-to-day lives that fascinated me when I first arrived here. Two months after we arrived here, I emailed my family a list of things that were different from what I knew. I had another look at the list today, and thought I would post it here. Please note that this is my perspective and my opinion; some of these things might be familiar to those who live in South Africa, and perhaps not everything I have seen is typical of London. These are purely my observations of things that I found different. Interesting, as I read through it, I realised how inured I have become to most of the items on the list. I found myself thinking, “Oh, right – that was new to us back then”. 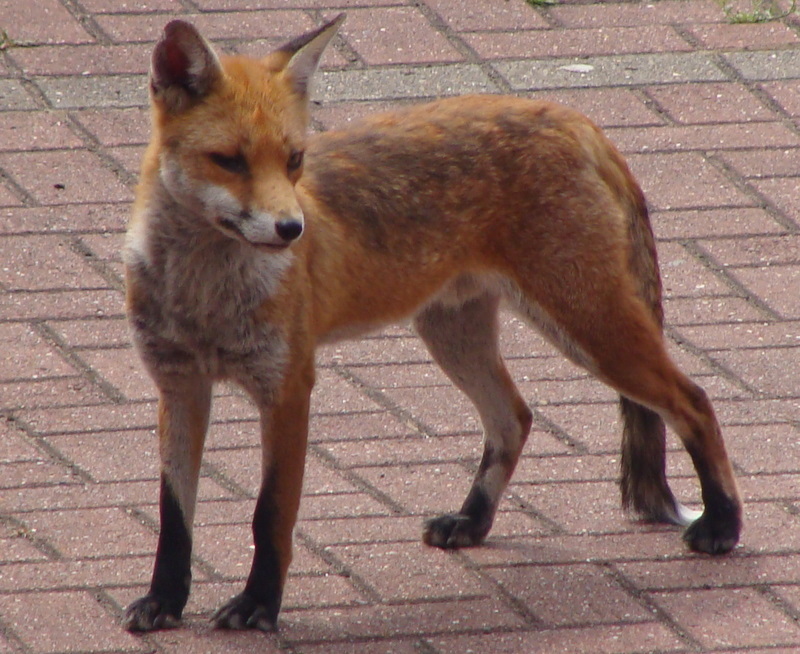 We saw a fox in our car park the other evening. We have power showers in our bathrooms: you turn on a power switch on the bathroom wall, and then press the “on” button on the shower, and out comes hot water, instantly. At Tesco (supermarket) you pack your own groceries into bags. And you get “green points” (like extra loyalty points) on your Tesco card if you bring and re-use your own bags. The shopping trolleys at our local Tesco have a sign on them that reads: “These trolleys are programmed to stop automatically when pushed beyond the red zone.” The perimeter of the shopping centre (i.e. the car park) is colour-coded, with the red zone being the outermost zone. If you push a trolley over that line, it will literally stop. We discovered through experience, and wondered why the trolley stopped suddenly, jarringly, and would not budge a further inch. Despite commonly held beliefs, Londoners can be pretty friendly and helpful. It seems to be OK to swear on television (not on the news though). You can get arrested, or at least a warning, for peeing in public. Some buses won’t stop at the bus stop you’re standing at unless you flag them down. If you’re travelling on the bus, you need to ring the bell for it to stop at the next bus stop. Unless someone flags it down from the bus stop or a passenger rings the bell, it will not stop. Some bus drivers will wait for you if they see you running for the bus. At some shops you can scan and pay for your purchases yourself – i.e. no cashier involved. Sometimes it costs you 30p to spend a penny [go to a public rest room]. Wherever you go in London, you will encounter people from a huge variety of nationalities. It is truly a multicultural society, quite remarkable. I thought we lived and worked in a multi-cultural world in Cape Town, but honestly – we know nothing compared to a city like London. You can’t buy green (Sunlight-type) soap, and the local mayonnaise generally tastes junk. You can’t buy margarine in the UK – it is an illegal product. And you can’t buy cane spirit in the UK because it destroys your memory. You can get about 80 channels on Freeview television. But a TV licence costs about ZAR1,500 a year [£145.50]. On weather reports on TV and the radio, they use terms like “bright”, “breezy” and “dull”. I continue to notice new things, as you know, and I usually blog about them. I’ll never be a Londoner, but I can now make my way around a city that initially felt so wildly “forrin” to me. Our church has just had an International Weekend, celebrating the diversity of cultures and nations represented among our church’s number. As one who loves language and is fascinated by pretty much everything, I have had a cracking weekend – just amazing! The church we belong to is a real inner-city church, and describes itself as a local, international church. It is a true microcosm of the broader population of London, with a diversity of language and culture that I have never experienced anywhere before. On Friday, I went to help out at the church’s weekly coffee morning. At the early morning prayer meeting for both the coffee morning and the International Weekend ahead, one of the elders prayed that an Italian person would come to the church. For some reason, he had Italy on his mind. Half an hour later, as we set up the coffee table and people started arriving, a woman walked into the church and stood awkwardly (without her cell phone!) and alone in the body of the church. Two women went over to greet her, and asked if this was her first visit to the Friday event. She didn’t understand what they were saying, because she spoke no English. She was from Italy. We were all wide-mouthed and blown away; an immediate answer to a specific prayer. She smiled graciously and told me her name. She beamed at the thought that I might be able to communicate haltingly with her, and I confessed my limited ability. I managed, however, to tell her how welcome she was and she smiled broadly. Either she was pleased, or it was because I might have said, “he is welcome”. At our International Weekend, church members were invited to dress in their traditional outfits and to bring their traditional foods to share. I’m sure I’ll miss some out, but nations such as Nigeria, Sierra Leone, America, South Africa, Zimbabwe, Ukraine, Uzbekistan, Scotland, Ireland, England, Iraq, Brazil, Germany, Iran, India, and Thailand were represented both sartorially and culinary-wise. Reflecting on this extent of diversity I realise that while I am a lover of language, there is a lot that I know a little about. I so wish that the reverse were true, and that I could have had a decent conversation with Friday’s welcome visitor from Italy. I also studied French at school and majored in it at university but, not having had the opportunity to work with the language, nor to spend time in France, my rusty and limited knowledge of spoken French leaves me little to say of interest. I went to night school to study Xhosa when I lived in Cape Town. Xhosa is one of the 11 official languages of South Africa, and is indigenous to the Eastern Cape and the Western Cape (where Cape Town is). It is difficult to learn for a few reasons: there are three different clicks that you use, and the mastery of these clicks alone is a huge challenge; the structure of the language is quite different from any other language I have studied, with its use of compound words being the biggest challenge for me. It is a beautiful language and so many of its expressions relate to the culture and the nature of the Xhosa people. When you see someone for the first time in a day, it is important to greet him and ask how he is. The answer is usually an honest description of how you are; I’m fine, thank you does not feature, as far as I know. It is possible, however, just to say, I am here. I love that. Sometimes I am just here, there’s nothing more to say. I loved learning Xhosa, and practising it with my friends and colleagues. Like any other language, practice makes perfect and it is easy to lose the language if you don’t keep speaking it. So now I could have a conversation with you in Xhosa, if all you wanted to know was how I was, and what my name is, where I live and that I am married. We could then smile at each other, and look awkward. I could also tell you that I have two small boys, but that would be a lie. Truth is, I can’t remember how to say I have two young adult sons. I gathered she was a big fan of this romantic comedy that has now finished its run on BBC, and was sad that this dear actress had passed away. I did, however, find her method of sharing the news quite fascinating. So that made me think that it was time for another post of talking forrin. If you’re new to my blog, this is something I write about from time to time: sharing new words and expressions that I hear here in the UK and words that I know from a lifetime in Zimbabwe and South Africa, that I know mean nothing over here. To get the hump: this means to go into a sulk, to get upset or fed up about something. I watched a quiz show the other day on the telly (as television is fondly known over here). When asked how she’d like to spend her prospective winnings, a contestant said she’d like to travel to Egypt to see the Pyramids and to ride a camel. (The programme was clearly filmed before the current events in Egypt.) Her adversary, who’d not been doing as well as he’d hoped, then said to her, “Well, love, sorry but you won’t be able to ride a camel.” “Why?” she asked. “Because I’ve got the hump,” he said. Flower. This is a term of endearment, used particularly in the north east of England, around Newcastle. A Geordie term, if you like. I travelled up to Newcastle for a conference last year, and I absolutely loved the city – it was such a beautiful surprise, and I’d love to travel there again when I can spend more than two days there. I am also mad about the Geordie accent. I went into a little newsagent in central Newcastle, and the shop owner said to me, “Can I help you, flower?” I immediately adored the expression and wanted to put her words and her accent into bottles and buy a dozen. Thick: this means dim or unintelligent. It is often accompanied by putting your tongue between your bottom teeth and your bottom lip and making monkey-type noises. Go on! This expression crosses the cultures, for me. Its use as I’ve heard it in England is quite different from its use by my Dad. In England, if someone is trying to persuade you to do something, and you’re hesitating and not quite sure whether or not you want to do it, and then decide you will, you’ll say, “Ok, go on!” By contrast, I grew up with my Dad saying this to me every time I’ve told him something that I find amazing. “Hey Dad, the Springboks have just won the World Cup! Again!” He would say, “Go on!” which, in a slightly patronising way, means, “You don’t say?” or “Well, I never” or “Knock me over with a feather”. Gutted. This expression means cut up or distressed or extremely disappointed by something. So, for example, if your house burnt down and you lost all your possessions in the fire, you could well be completely gutted. Knickers in a knot. If you get yourself into an unnecessary panic about something, you could be getting your knickers in a knot. Faff: this verb means to waste time doing unimportant things while you’re supposed to be doing something important. It could take the form of procrastination, or it could be fiddling about doing things when you’re supposed to be going out. You can either faff or faff about. Either is annoying. All over the shop: this means everywhere or disorganised. For example, “He was trying to explain to me what happened, but his mind was all over the shop and I couldn’t follow what he was saying.” The equivalent expression I would use is all over the show. Naartjie (pronounced narchy): this is the term I would use for tangerine, Clementine, mandarin. It refers to any orange citrus fruit (apart from an orange) that has an easily-removable skin and is easily divided into segments (which I call skyfies, pronounced skayfies). Chaff (pronounced charf): this word also has a dual meaning, and is no longer really in common use. It can mean to chat up someone, or it can mean to stretch the truth. So, for example, a guy might meet a girl and, if he fancies her, he might chaff her. When I was at junior school, I remember reading our school magazine during one of my holidays. It was quite an honour to have your story or poem featured in the magazine, and I always read others’ writing with interest. I remember reading a story written by a girl who was a year younger than me, which would have made her about nine. It was a fantastic tale, that I was struggling to believe, but I persevered with it because, hey, it had been featured in the magazine. When I got to the end of her story, she had written “Chaff chaff.” (Which meant she had made up the entire story.) I was horrified. Ja (pronounced ya): this means yes. Hanguva: this means very or a lot. For example, in London lately, it’s been hanguva cold. Stroppy: this means difficult, aggressive, uncooperative. For example, actor Russell Crowe sometimes gets stroppy with the paparazzi. Koppie: this means a small hill. There is a koppie in the middle of a park near where we live, and if you walk to the top of it, you get a great view over south east London. Dof: this means dim, or not very intelligent. (See thick above.) For example, if you can’t find something or don’t understand something, you might say, “Sorry for being dof, but I don’t know what you mean.” So it usually refers to a temporary state of mind, rather like having a brunette moment. I hope this has expanded your vocabulary horizons somewhat, and I’d love to know some of the interesting words and expressions that you use at your ends of the stick. I won’t get the hump if you don’t, but I’d be hanguva interested to learn more words. Thanks for reading, flowers. The pen is mightier than the sword, so we’re told. But the pen would be pretty ineffective without words. Words and language. We use them to encourage, to destroy, to belittle, to praise, to teach, to instruct, to entertain, to sing, to praise, to mobilise, to raise awareness. Sometimes we use them wrongly and miss the mark. Other times they just make us laugh. Let’s laugh today. When I was little and living in Zambia, I used to run outside when I heard my Dad’s car rolling into our driveway at home. I was always excited to see him and tell him what I’d been doing and show him new things I’d learnt. Like how to put a record on the gramophone player, all by myself. Or how I’d learnt to read my new school book. My Dad would come inside, greet everyone and take his seat in the lounge and exhale. He’d ask me to use my new-found skill and switch on the radio. He’d tell me to look for the ivory button with SW1 written over it, and then I had to push the button down and wait for the dulcet tones of newsreaders sharing information worldwide. I remember hearing their words booming through the fabric-lined speakers on our gramophone player. Topical in those days were issues in what I thought was the Serviette Union. I always imagined a nation filled with napkins, and I couldn’t work out what they could possibly be squabbling about. Who’s laying the table? When I’d pour myself a glass of orange and water (we weren’t allowed fizzy drinks), my Mom would always caution me, as I thought, not to fill the glass “to the broom”. I used to wonder what the broom had to do with the glass and the juice, until I discovered brim was probably the correct word. My enthusiasm was sometimes tempered by my Mom’s saying, “Don’t go at it like a bulletagate.” I never knew what a bulletagate was, until I heard the expression “bull at a gate”. One of my husband’s favourite albums, when we were students, was Cher’s “I Paralyse”. The first time I heard him mention it, I thought he said it was called “Five Barrel Eyes”. He’s never allowed me to forget that! More recently, we’ve discovered a fabulous singer/songwriter here in London, called Rumer. One of her recent hits is a song called “Aretha”. Do yourself a favour and check her out here – she’s really quite special. I had heard this song on the radio for months, and I thought the opening line was, “I’ve got a reason, in the morning.” I didn’t really think beyond that. When we saw her live, I realised the line was in fact, “I’ve got Aretha, in the morning. High on my headphones and walking to school.” Go figure. Before my husband and I were married, we were gathered together at my family home with all of my siblings. We decided to play Trivial Pursuit, which, in our family, is as much about asking the questions correctly as it is about getting the answers right. And all the chirps and banter in between. My family is merciless. (No comments, I know what you’re thinking!) It came to my husband to read out a question: “For which feature film was Duelling Banjos the theme tune?” My family, to a man, collapsed in a hysterically laughing heap. You know when you look at a word and it looks well forrin? Well, my husband had looked at the song title and pronounced it: “Dew-elling Ban-Joss”. Needless to say, he has never been allowed to forget that slip of the tongue. He needed the movie title in more ways than one: Deliverance. I’d love to hear about your funny words, misheard and mis-pronounced. Words keep us connected in so many ways, but they also tear us apart and crack us up. I’d love to hear your examples of the latter. The thing about accents is that you only notice them when they differ from your own. At home in Cape Town I never notice my own accent but here in London, it’s another story all together. I’m well forrin and can’t hide it. I heard the tail-end of a discussion on a TV talk show this morning. One of the guests said, “When I speak to someone with an accent, I start talking with that accent. I can’t help it.” And everyone laughed. There is also the tendency to speak louder and more slowly when you speak to someone with an accent other than your own, or someone whose first language is not the same as yours. So that was my prompt: I thought it was time to talk a little more forrin and share some more of my language idiosyncrasies with you. It’s funny, I never notice them at home and yet here, in London, they stick out like the proverbial sore thumb. Is that a well-known expression? Long teeth. This is a direct translation from the Afrikaans. If you do something with long teeth it means you do it with extreme reluctance, dragging your feet, not wanting to do it at all. Whinge. This is in common use in England and in SA, and it means to complain, or to whine, but with an extra truckload of annoying-ness. Land with your bum in the butter. I’m not sure where this saying originates, but it means to be lucky, to have things go your way. Gedoente. Again, this is an Afrikaans word (don’t know how to explain its pronunciation) and it means (usually unnecessary) fuss. Or, in the words of a client that I worked with in a PR consultancy, it’s a major bloody marchpast. Anorak. This one fascinates me. The word, which means hooded raincoat or parka, has evolved into slang usage, and it means fan, fanatic, aficionado, knowledgeable one on a particular (unusual) topic, and perhaps in an obsessive way. So you could be a train anorak or a Star Trek anorak (Trekkie). In bits. I heard this expression on the news last night. The reporter was covering the story about the guy whose wife was murdered in South Africa last month, while they were on honeymoon. The taxi driver, convicted of the murder, implicated the husband by saying he’d been paid by him to murder his wife and make it look like a car-jacking. The reporter said the husband, at his home in England, was in bits. It means upset. It’s often associated with crying. In this context, the expression strikes me as the exact opposite of hyperbole. Winding me up. This means teasing me, having me on. The local radio station we listen to runs many competitions, including one where you have to identify three mystery voices. The jackpot grows with each wrong guess and it continues to grow until all three voices have been correctly identified. Earlier this year, a listener won £100,000 when he did just that. His reaction? “You’re joking! You’re winding me up! You must be winding me up!” I must say, that was my favourite kind of reaction! This is an ongoing project, learning new expressions and discovering the forrin-ness here of the ones I use. If you have any suggestions or contributions, it would be lovely to hear them! And I do mean lovely.